“The world breaks everyone and afterwards many are strong at the broken places,” Ernest Hemingway famously wrote. Traumatic events shape and define us. Child loss is considered to be among the deepest and most lasting traumas and impacts adult mental health and relationships. When she is not writing, Ennis raises money for orphans. Above all, she raises her four-year-old son, Luke. She is also a military wife, married to Lt. Col. John Ennis, USMC. She came to the wisdom reflected in Still Standing as so many do: through unimaginable adversity. She and her husband experienced a decade-long battle with infertility. Efforts to adopt failed. Following numerous interventions, including in vitro fertilization (IVF), they became pregnant with their son Matthew, who was born at term and lived one day, owing to a rare and undiagnosed complication that occurred during his birth. She was devastated and looked for ways to understand the grief she felt at the loss of her longed-for child. Following another round of IVF, she gave birth to her second son, Luke. After Luke’s birth, she lost a set of twins, one child at seven weeks and the other at 14 weeks. When Luke was two years old, Ennis’s husband was deployed to Afghanistan on a one-year tour of duty. Solo parenting a two-year-old after loss presented unique challenges, to which Ennis quickly rose. I had the opportunity to speak to Ennis about her journey. 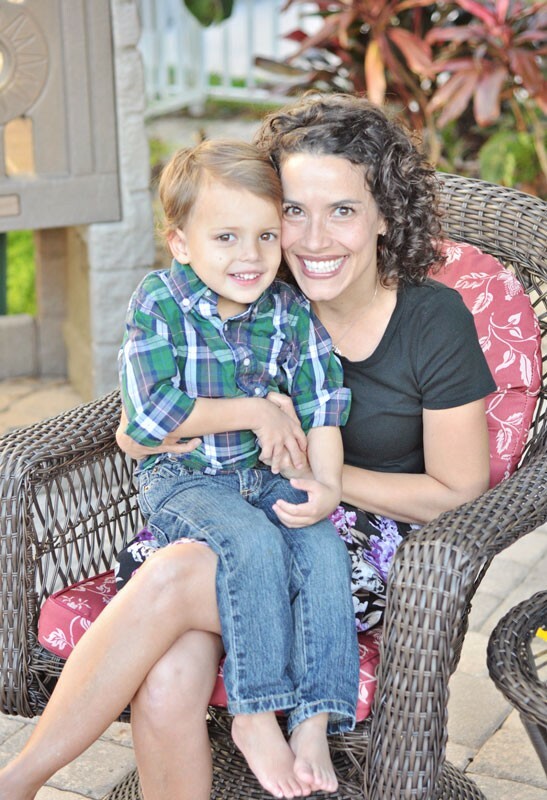 Q: What do you think civilians misunderstand about the life of a military Solo Mom? A: I think that people don’t always see it as single parenting—it is not exactly the same thing, but there are parallels. You may have a spouse, but if he is deployed, he is thousands of miles away, and when you and your kid are both sick at 4:00 a.m., this fact does not address the situation in a practical way. It still takes a village. Sometimes people think that families “sign up” for it and that should make it somehow easier. But the fact is that no one ever really knows what it means to sign up for something until they are in it. And a whole village of people in a similar situation can be kind of hard to harness. People understand that the military community is embracing because it is—there are many kind and wonderful and generous people—but you are still alone at 4:00 a.m. with your sick kid and the bills to pay. Q: On a daily basis, what sorts of things do military moms face as they run a household? A: A lot of people believe that military spouses and their kids have [the] resources that they need when, in fact, they often don’t. Or these resources can be hard to access, especially if the primary beneficiary is deployed. Lawmakers like to sound like they are in touch with military families, and I do believe that many of them do their best. But at the end of the day, all the bounce house family days don’t make up for a deployed spouse who is effectively unavailable for daily help at home. That’s what they are—command-sponsored “family” days—and yet an integral part of the family is missing. It is nice for the kids and the Solo Mom, no doubt, but yeah: [it’s] still not like having dad at home. There are programs that people can qualify for, but they often have particular requirements. Child care is a huge issue for military families. For example, people may qualify for help if a parent is deployed, but only if the other parent is working full time. It depends on the branch of the military, but some branches are all or nothing. Sometimes moms need a break even when they are not working outside the home. There are programs for the Exceptional Family—for families where a child has special needs—but accessing these services can be hard; and even if services are approved, it does not always cover all the needs associated with multiple medical and therapeutic appointments. So people say that military takes care of military, and, yes, this is true; but accessing services in any bureaucratic government structure is hard, especially when you are parenting alone and needing to do everything from laundry to specialized medical services. It can beat you down. Q: So, speaking of specialized medical services, how did you and John cope with Matthew’s death? A: The military was really wonderful after Matthew died. They delayed a scheduled move; they encouraged us to seek counseling as a couple. We went to counseling for a while, and it was really helpful. I remain so grateful for all that support. We wanted to get pregnant again, and we did. I was pregnant, and then Luke was born and he was healthy. He was such a blessing. Afterwards, I lost a set of twins. I would just say that navigating infertility and child loss and grief in any setting is hard. This is no less true in the military. After the twins, I was told that further infertility treatments would be dangerous to my health. While there are counseling services available in the military, there can sometimes be a culture of resistance about asking for therapeutic help, and this complicates things. Grief in the military is such a part of the experience but so, too, is the need to attend to daily tasks and function on a practical level. You pay the bills, get the kids to school, you take care of them. Q: What resources were available to you as a mom who’d experienced a loss? A: Nothing that was really specialized to the military beyond couples counseling. We did attend our local pregnancy/infant-loss group sponsored by our local hospice. That group and those women were pivotal to our healing—feeling supported, and feeling “normal” and loved. At the time of Matthew’s death, there were some groups . . . The Compassionate Friends and some others. But I was not sure where I fit. That is some of the reason [why] I started working with Still Standing. Sometimes getting help is made harder by a lack of child care. If you have limited time and resources, getting out of the house for self-care is hard. Q: When Luke was two, John was deployed to Afghanistan. What was that like? In the course of a few years, there had been infertility and pregnancy, baby loss, and more infertility treatments, and then your pregnancy with Luke and his miraculous birth, followed by the loss of twins. There were also failed adoptions along the way. How did you cope with all of this? A: Yes. Well, I became aware of the fact that I had to limit myself in certain ways to control my PTSD. It is weird—before Matthew died, I did not worry that much about John. I just trusted somehow that he would be OK. I don’t really know why—I mean, he is a test pilot, and sometimes the things they test don’t work. After Matthew died, I knew the worst was possible. When Luke was two and John was deployed, and we had been advised to stop further fertility treatments, I sensed I had to protect myself. I could not watch the news and imagine John in Afghanistan. There was [a] potent mix of fear I felt I had to beat back: as a military spouse with a deployed husband, I worried for him, and as a loss mom of a living child, I had traumatic grief and worry issues. A: Oh. Well, I tell you, my word for the year that John was gone was opportunity. All the things that were difficult remained so. But I had a year that was only us—[a] year for Luke and [me]. Matthew’s death taught me to take nothing for granted. After all that had happened, I knew I had to see it and to treat it as the gift that it was—in spite of everything or, maybe even more so, because of everything. We traveled all up and down the mid-Atlantic and the Southeast. We just did things we’d never maybe have the chance to do again together—without the worry of a work schedule or a school schedule. It was beautiful. Lori Mullins Ennis invites those who would like to read about others who have experienced infertility, baby loss, or child loss to visit Still Standing magazine.